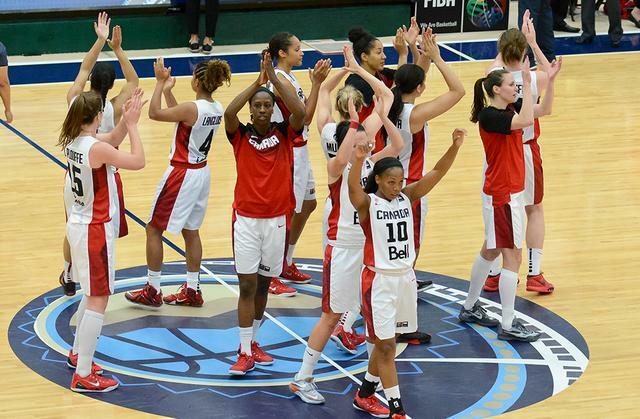 EDMONTON (2015 FIBA AMERICAS WOMEN'S CHAMPIONSHIP) - The second semifinal of the 2015 FIBA Americas Women’s Championship will have the hosts Canada battling traditional powerhouse Brazil for a spot in the finals of the competition. Canada has been perfect in this 2015 edition, not only because of their 4-0 record in the Group phase, but because the team currently leads the championship in points, field goal percentage, rebound and assists per game. The level of play for Canada has simply been world-class. Their attack is varied, with an unprecedented depth that features leading scorer Kia Nurse (12.3 ppg), along with seven other players averaging plus eight points per game in the competition, and a bench production that averages 49.3 points per game against their opponent’s 21.5. The point-differential has been of 52 points per game so far in the competition. Outstanding. They will play a Brazilian team that comes off of a heart-breaking loss against eternal rivals Argentina and that already has an automatic qualifying spot to the 2016 Rio de Janeiro Olympic Games as hosts. Brazil hasn’t been consistent enough to dominate in this 2015 edition of the championship, even though they have brought a talented team to Edmonton. Nadia Gomes Colhado has been a big presence in the paint and is poised to be the star of this semifinal game for the South American team. She leads the competition with an average 13.5 rebounds per game, while having an identical figure in the points per game category. There’s no forgetting veteran Iziane Castro Marques though. The 33-year old has been one of the offensive greats of the competition, averaging 15.8 points per game, with a supreme ability to find a good shot anywhere in the court. This game will be the 13th between Canada and Brazil, with the South American team winning 8 out of the 12 previous matches. Brazil has won every game that the teams have played in the FIBA Americas Women’s Championship before. All matches of the FIBA Americas Championship will be seen on television in the following countries, and on the web through the payment service livebasketball.tv. For more coverage of the FIBA Americas Championship 2015, visit fiba.com/Americaswomen2015 and follow us on social networks @FIBA to keep up with the latest information from the competition.